The three month contract was over, but not before I agreed to sign an extension until the end of the season. I left for home, satisfied with my performance over the first half of the season and eager to get back in three-weeks’ time. After all, it was going to be the Swedish summer and temperatures could reach +20, great news! Many of the common beliefs about Sweden are true. It’s incredibly expensive (£7 for a coffee in town) it’s extremely cold for most of the year, the winters are long and dark and during mid-winter it’s only light from 9am until around 1/2pm in the afternoon. The swedes are used to it though, daily life goes on, public transport doesn’t grind to a halt like it does here and if there’s snow on the pitch, shovels and a few willing volunteers soon see to that. We’re lucky where we play as the stadium has underfloor heating, so the pitch is rarely unplayable during the tougher months of the season. One thing that I couldn’t be prepared for however, was the length of journeys to away matches. 6 hours one-way was one of the shortest journeys and at worst, we travelled 12 hours one-way (even via a private train on an empty freight line) to Gallivare, deep inside the arctic circle and one of the most northern places in Sweden, situated further north than Alaska on the world map! The journey came to a halt twice as we collided with moose on the track, an occurrence that is prevalent on Swedish roads and rail-lines. The Swedes shook off the collisions as if it was just another one, all whilst us Brits were sat in disbelief at what had just happened. These animals are far larger than a horse and we had just hit two with a train-shuddering thud! Just another day, right? On such journeys, a laptop with some movies, a pair of headphones, a lot of food and a pillow are essentials – sometimes they’re the first things I pack, even before the boots and shin guards. Following the summer break, I returned to Ostersund recharged and excited to see what the following 3 months had to offer. The weather had picked up and I could finally head out of the house without the need for thermals! We began the second half of the season well and went on an impressive run of form, climbing up the table. 6-0 & 4-0 home wins against Moron BK & Anundjso were the pick of the matches and I had adapted well to my new position on the right-hand side of a front 3, contributing 6 goals and 3 assists in my first 5 games back. I was becoming an integral part of the squad and with that, my confidence was growing. Further wins against Gallivare and Harnosands followed, before the season drew to a close away to league champions Skelleftea. I was suspended for this match as 3 yellows over the season warrants a one game ban! A bizarre rule that sums up Division 2 in Sweden, although that’s maybe just because I’m from Scotland! Nevertheless, I travelled with the squad and we took in our season over a few beers in Umea afterword’s. I had arrived in Sweden, completely unknown to anyone, and myself, totally unsure of what to expect but had managed to finish top goal-scorer for IFK Ostersund with 13 goals in 19 games as we finished 5th in Division 2 Norrland, having only been promoted to this league a few months earlier. Living with a family who were so welcoming and showed me around the city as well introducing me to many new people helped me settle quickly. I think it’s a tough ask for somebody to drop their current life, head to a new country where they know nobody and be expected to perform to a high level. However, to do something you truly love, you find it deep within you to get over any fears or worries and instead focus on what you are aiming to achieve. Relationships with teammates and coaching staff were also a crucial part during my first season in Sweden, having other British lads playing for the team also helped. 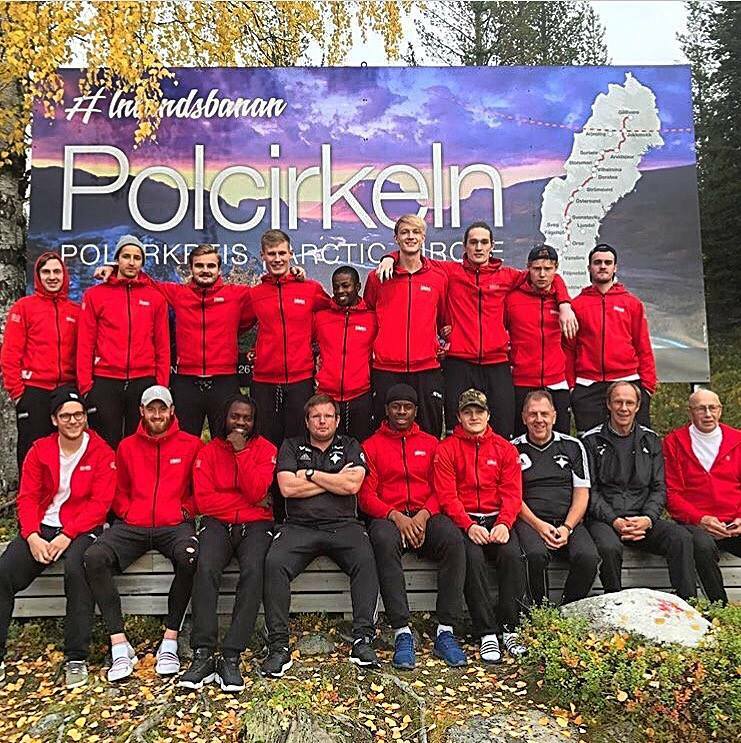 Second from left, bottom row in squad photo on return journey to Gallivare. A typical day for us Brits who were full-time would consist of a gym or ball-work session in the morning, using our team fitness pass, before heading for lunch, provided by the club, at a local healthy restaurant. Then chilling out during the day (or for me preparing coaching sessions), perhaps meeting later for a coffee in town or at one of the boy’s apartments for a Fifa tournament before training in the evening. The relaxed environment helped my comfort levels and allowed me to completely focus on my football. I have commitments back home, including a long-term relationship and sometimes it becomes difficult being so far away, but if your loved ones are supportive of your dreams then it makes the whole process a lot easier. Plus, there’s Facetime nowadays to help keep up appearances! I sit here, almost a year to the day since I made the decision to begin contacting clubs. I am proud of my decision and thankful for everything I have experienced, from the people I met and the sights I saw to my personal performance in my debut season. I had offers, some from other countries, to move elsewhere for next season but I feel there’s more to come where I am and more for Sweden to offer me. I’ve signed a new one-year contract with IFK Ostersund and I can’t wait to head back in February, even if it’s going to be -10. I’ve packed my thermals and ditched the Nike running trainers! Can it go any further? I hope so and I’m going to do everything I can to make that happen. To any footballers out there, itching for a fresh start and a chance at full-time football in another environment: think outside the box. You might have to do all the work on your own, but if it pays off, it could change your life forever, or at the least, give you lifelong memories and friends! Here’s to 2018. I’m living my dream!